Lotus boss Eric Boullier believes that his team is still in the hunt for the 2012 Formula 1 world championship, despite Kimi Raikkonen’s failure to fight for victory in the Belgian Grand Prix. Raikkonen had gone into the Spa weekend as many people’s favourite for the win, but his set-up choices left him unable to pose a serious threat to race victor Jenson Button and he could only finish third. 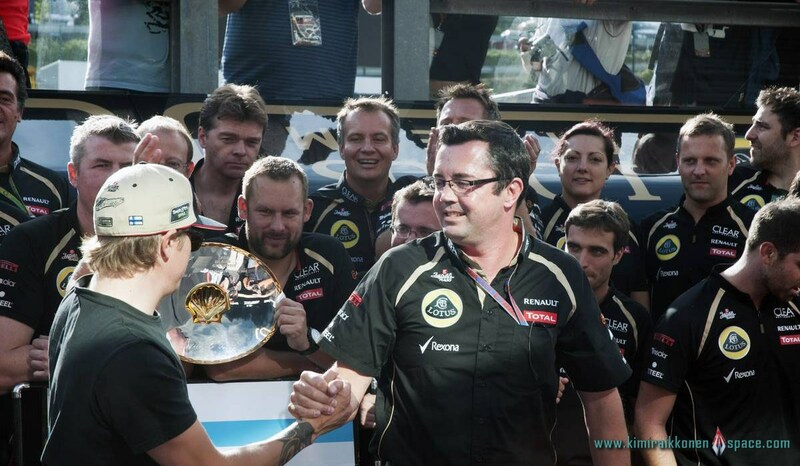 Nevertheless, Boullier maintains his faith in Lotus’s potential, and is sure a good end to the campaign could still result in Raikkonen becoming world champion. “I believe in myself that he can fight for the title definitely,” explained Boullier, whose second driver Romain Grosjean is banned for the next race in Italy following the first corner crash in Belgium. “It is up to us to give him a good car and not miss any opportunity, but Kimi does not miss much. Boullier also believes that Raikkonen did the best that could have been expected of him in Spa, including a spectacular overtaking move past Michael Schumacher into Eau Rouge. HOWEVER, Mr Boulllier must take note of the fact that strategy is clearly a problem at Lotus. Ferrari have a slower car than the E20, but they somehow are winning races and are leading the drivers standings. One lap race pace MUST be improved for better qualifying positions, or Kimi wont win the championship. Its as simple as that. @leonardo, I agree with you completely. There comes a stage when they have to say enough of 2nd and 3rd lets get this car on Pole and win. Lotus should get rid of the “scared to lose mentality”, take further risks and win. Kimi is screaming inside that car!! I don’t want to comment, actually I don’t know what to comment on Lotus (Boullier).Lets just hope that whole team know what are they doing.Kimi will do his job 100%.It’s up to them to make the difference.They are acting like multiplier on Kimi’s result.Strategy is now bit better.That’s up to Kimi and his racing engineers.But I still think they should use second or even third driver as a testers at least for one friday session. It’s not 3 podiums in last 4 races. It’s even better.4 podiums in last 5 races! do u still feel lotus is a better team than mclaren in 2012 ?? Mayb lotus aint a better team than Mclaren,this season. Bt KiMi is defently a better pilot than both Hamilton nd Button… Nd watchout for him at Monza!! I have always been a Fornmula 1 fan and have watched almost every race sine since 1992. The last couple of years i have found Formula 1 starting to bore me. But that changed to very interesting again as soon as i read that Kimi had signed for Lotus! Kimi is great to watch and somehow he manages to stay away from trouble like all other drivers. When was the last time you saw Kimi had to pit because of being hit by another car? A podium every race makes a lot of points! The best is that i think Kimi is enjoying Formula 1 again. There are no doubt that there is no driver in the Formula 1 circus that have the talent and speed that Kimi have! There is just a matter of time before Kimi will stand on top of the podium. About Grosjean he did a little mistace but if you ask me Grosjeans car was past Hamiltons car so i think that Hamilton should have gotten off the power. If he had done that there would not have been a crash so i do not think Grosjean is alone to blame for that since it is also Hamiltons fault. But most important is that Kimi is back and what a comeback Kimi have done so far. You are doing great Kimi!! This is what i ment to write! Kimi is great to watch and somehow he manages to stay away from trouble unlike all other drivers.